Blog – When Has Kindness And Equality Ever Hurt Anyone? TLDR; this drunk racist – Adam Purinton – shot up a bar after assuming these men were Middle Eastern; then drove to an Applebee’s 70 miles away where the police kindly spoke to him over the phone until he turned himself in…not sending a SWAT team after him with helicopters and such…because he was still a white American, benefit of the doubt. First of all, the headline should read: White Racist Murders Immigrant after Screaming ‘Get Out of My Country.’ I don’t understand how this is not a hate crime. The President wants to keep a list of crimes committed by Immigrants, when the better exercise is to track the crimes in which immigrants are victims. 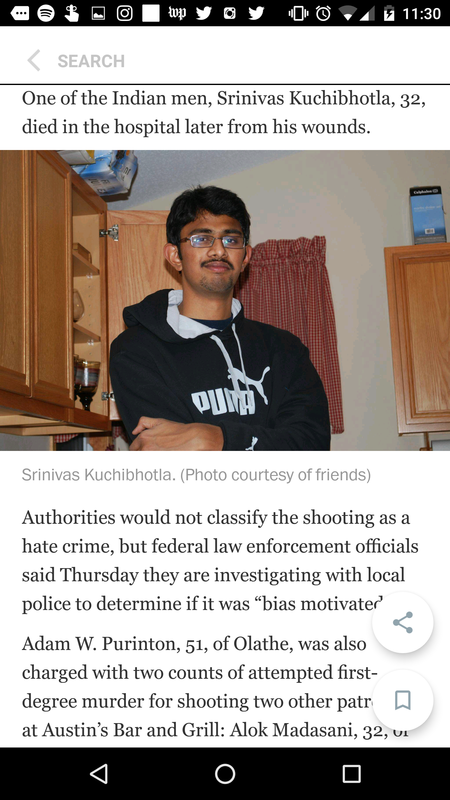 Oh wait…those are all hate crimes. Southern Poverty Law Center and the ACLU have us covered, I am sure. Second of all, YOUR country? I don’t want to talk about how immigrants built this damn country and continue to help it make strides and advances. What has this drunk racist – Adam Purinton – done to lay claim to this country with such conviction that his teeny tiny brain only had time for bigotry and a personal ownership stake in the country? America is not your front yard. What are your contributions? And don’t come at me with immigrants came and took my job. Was this drunk racist – Adam Purinton – an engineer? Was his job coding GPS apps and software taken away? He apparently thinks all brown people are the same so I doubt this drunk racist – Adam Purinton – has the brain capacity to know computer language. How is this for irony? The orangemort himself is a first generation American. His parents were immigrants. That is TWO presidents in a row now. And you have the NERVE to say your country? This is OUR country, you backwoods buffoon. OUR country means, unlike the rest of the unlucky world, we are blessed with the beauty of heterogeneous people. That means we got everything, and if it wasn’t for drunk racists like Adam Purinton – we could all co-exist happily. You know why people LOVE America around the world? It is not the opportunity for some land grab or coming here to steal your gold fillings, it is because of the freedom to exist and find like-minded people who share your values. People like the drunk racist – Adam Purinton – may have failed US history class in more than one way. Or did we fail him? Do we care so much about standardized testing that we forgot that critical thinking really is the necessary skill people should have when emerging from educational institutions? I don’t remember what the hell a parabola is but I know that America was founded by people not seeking a better life, but told they no longer fit in with the society of their homeland. Either you couldn’t find work or you were ostracized or you just got tired of the cold and terrible food and decided to get on a months long boat journey to a literal new world. Like the unknown is better than the known. THAT is what makes America great, it has been 200+ years and America still manages to capture the excitement and opportunities of a “new world.” That is what makes people want to come here. Oh your country is murdering you and stealing your lands? Want opportunity in a country where you get to keep what you earn and don’t have to worry about your kids being dragged off to fight a war without end? Well, maybe we look somewhere else for the time being because private citizens are out here murdering people to prevent them from having normalcy. OWL: something something creature feature I really enjoyed that movie. Me: The one where they cast Matt Damon to play a Chinese man who defends the Great Wall? Side note: What white man went to China and rallied Chinese people behind him in battle? NONE. Therefore it was based on a Chinese man. ME: No. They re-wrote the character to fit the casting. The man was supposed to be Chinese. That exchange had me feeling a certain kind of way. WHY can’t people see what I see? Is it my job to wake people up? Lady, did you really believe a white man was leading Chinese warriors or that the last Samurai was white? COME ON. Representation is a passion project of mine, but that is a digression for a different day. For the rest of the day, I was only seeing people behaving and acting from privilege and I was really torn between saying something and keeping my job. My work friends (are all women, mostly minorities) counseled me to calm down otherwise I would get a reputation of being combative. And as I would confess to my “friend”* the next day, that is the statement that drove me over the edge. Why? Because acquiescing to the fact that some people are going to remain ignorant is no longer an option for me. And this shooting is exhibit A why. I know it is new ground to tread. I have always been one of those women who will covertly share a glance with all the minorities in a room when we hear something that was totally off. But why? Why is that our code? We aren’t speaking up because we don’t want to be seen as combative or challenging. But we die a little every day when we have to eat our words and feelings, don’t we? We are saying “OK, to keep this job I need to co-exist with a [fill in the blank] and put aside my right to be respected”. And that has to collectively hurt our souls. Because what is the difference between a drunk racist like Adam Purinton and a racist like AG Jeff Sessions? The power to affect change on different scales. Both are equally dangerous. One may shoot you, one will work to disenfranchise you and all your friends and family. Either way, both equally affect your right to exist. What other options do we have, if not to educate and foster empathy (aka kindness)? What if I just started pointing out things? Sometimes the challenges lead to better understanding and can offer an out of the box solution. Speak up and let your life experience present a heretofore unconsidered perspective, foster empathy and understanding where you can. I get that it is not my job to go around waking people up and that we can’t always account for every nuance because some people will always be asleep. If I am expected to operate at a higher level of everything because I am a minority, someone else doesn’t get to do the bare minimum and be deemed a decent person. If someone was actually asleep all day, what are they? Useless and/or dead (no hate to coma patients). Great, if you don’t want to wake-up then go somewhere else and sleep, but when you are around me, you will behave with kindness and promote equality. Because OUR country has shared values of kindness and equality and I will never stop working to show that nothing bad can come from those two things. *If you are reading this, I don’t know how to define what kind of friends we are either.